Yesterday I discussed a paper by Derya Özkan which briefly critiqued slum tourism. In the paper she mentions the blog “Favela Chic: The Formal Informal” by Adrianna Navarro Sertich. This blog focuses primarily on the informal city as such. However, as she also discusses the current fascination the North has with informality and “favelas”, it does contain interesting posts for those interested in slum tourism as well and is worth a look. As far as I know the documentary will only be shown in a limited number of places, but it certainly seems very interesting, particularly for those interested in the representation of slums in popular culture and the potential influence on tourism. Although still in its infancy, an increasing amount of work is done on the ethical dimensions of slum tourism as well as the way it is experienced by tourists. An aspect of slum tourism that has received much less attention is the perception local host communities to tourism. However, it would seem that we are missing a vital part of the puzzle with regards to slum tourism if we do not look at local resident’s perspectives. A member of the slum tourism network, Rita Duarte, recently finished her MSc thesis on this very subject for the Favelas in Brazil. Interestingly, she did not only look at the most popular tourist favela (Rocinha), but also at the lesser known Pereira da Silva. In her exploratory study, she uses a transmodern perspective and finds that residents on the whole have a positive attitude towards tourists. They view it as an opportunity to be seen in a more positive light than is normally portrayed in media. They are critical critical however, on the ways in which tourism is performed. Particularly in Rocinha imbalanced power relations between external and internal actors could be observed. 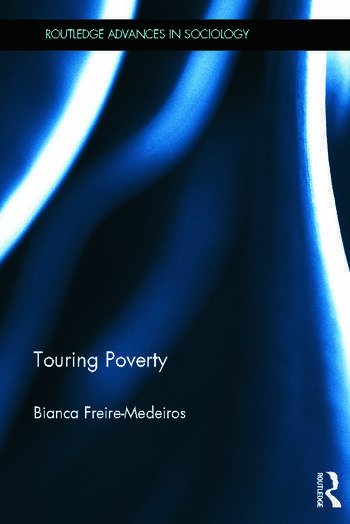 Duarte argues that local acceptance and control over the development of tourist activities is necessary to improve the social representation of favela residents. The thesis is an interesting read and sheds further light upon the complexity of favela tourism and the perspective of local residents. With this in mind, it would have been interesting to see more about conflicting interests and ideas witin the communities and between local community members, particularly in Pereira da Silva. However, as Duarte rightfully says the time and scope of a thesis is limited and there will inevitably be gaps when doing exploratory research. 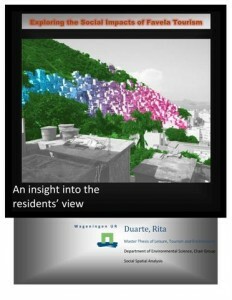 Duarte, R. (2010) Exploring the Social Impacts of Favela Tourism: An insight into the residents’ view. MSc. Wageningen, Wageningen University. The thesis can be downloaded from Wageningen university website. However, the link does not always seem to work, so you can also download it from Slumtourism.net directly. If you have an interesting document, thesis or report regarding slum tourism, please contact us so we can share it on the Slum Tourism Network.